It’s Time for the Annual Spring Sale! It’s my favorite time of year, not only for the weather, but because it’s also time to start thinking ahead to the new school year! Which means it is the perfect time to buy Build Your Library curriculum, because we’re having our 2019 Spring Sale! 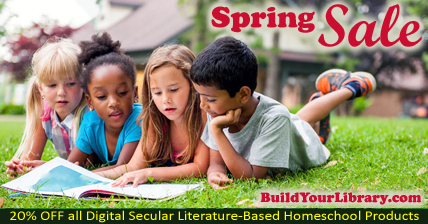 For the next two weeks (April 1 – 14) you can take 20% off your entire purchase of our secular literature based homeschool PDFs. So whether you were planning on buying a full year program or just wanted to try out a unit study or two to test the waters, you’ll want to shop the sale! Just use the code: Spring19 at checkout to take 20% off all of our digital products. It’s that simple! Now is also a great time to dive into one of our unit studies! We have a wide variety of units ranging from literary titles (The Hobbit, Harry Potter and the Sorcerer’s Stone Unit Study – Harry Potter and the Chamber of Secrets Unit Study – Harry Potter and the Prisoner of Azkaban Unit Study – Harry Potter and the Goblet of Fire Unit Study – Harry Potter and the Order of the Phoenix Unit Study, Harry Potter and the Half-Blood Prince Unit Study) to science (Darwin and Evolution, Sharks) to History and Holidays (Prehistory, World War II, The History of Thanksgiving, Winter Holidays, Jan Brett Christmas). There is something for everyone!